The dining room is often considered to be the center of your home. It is the place where you and your loved ones gather and enjoy each other’s company, have a glass of wine or dinner party, and is especially a special space for you and your family to share for dinner. For this social setting, we have created a few tips + tricks to not only help create that shared space to be inviting and comfortable for all of your guests and gatherings, but especially to excite everyone for the (quickly) upcoming holiday season! Because this room is a space shared by all, choosing neutral tones for your walls is recommended. 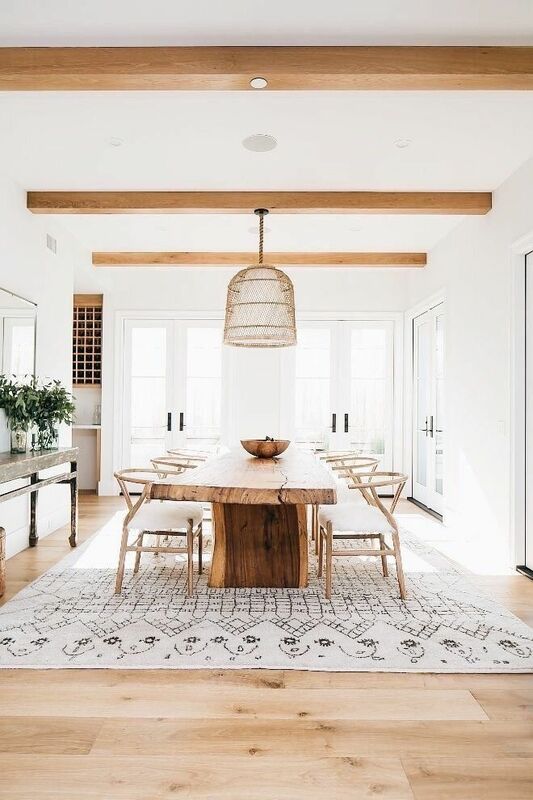 Because lighting, textures, tones, and other elements are considered, giving the dining room a fresh coat of paint easily compliments all of the other elements in the room creating a harmony. The dining room lighting is something of value in this specific setting because of the mood it gives off, and because a fixture can typically be the focal point for this room. Being able to determine the lighting is ideal so that the mood of your holiday party or quiet dinner is set. Depending on the size of your dining table and room as a whole, giving the room personality with a statement fixture is the way to go in order to create a look that compliments your style. Mixing textures and tones in the dining room is a way to keep the creativity flowing, without completely overdoing it. Complimenting your furniture with linens that have patterns or distinct colors livens up the space effortlessly. In addition to linens, mix and matching chair styles or textures can introduce the mix of styles that exist throughout your home. Once again…our favorite part! Accessorizing the dining space with personalized displays truly makes this dining room a part of your home! Some like to create a statement by displaying china, or dishes that have significance, as well as accessorizing with their favorite/ sentimental wines on a wine rack. Featuring your favorite greenery and candles in this room, maybe as a centerpiece, sets the tone to create that atmosphere we can all appreciate to relax and unwind! Stay tuned to see inspo + photos for this week's theme on our Pinterest page! And check out last weeks Tips & Tricks on Master Bedroom Ideas here!